As a young man in England in the early 19th century, Charles Darwin had been unable to settle on a career but had developed a strong interest in natural history. Therefore, he jumped at the opportunity to serve as a naturalist aboard HMS Beagle on an around-the-world surveying cruise. During the ﬁve years of the cruise, from 1831 to 1836, Darwin made detailed observations of plants, animals, and geology in the ﬁeld and amassed an immense specimen collection from South America, Australia, and Africa. Just before Darwin departed on the voyage, a friend gave him a copy of Charles Lyell’s 1830 textbook, Principles of Geology, which argued in favour of James Hutton’s proposal that the Earth had a long history and that geologic time extended much further into the past than did human civilization. Based on laboratory experiments conducted in the 1950s, researchers speculated that reactions in concentrated “soups” of chemicals that formed when seawater evaporated in shallow, coastal pools led to the formation of the earliest protein-like organic chemicals (“proto-life”). More recent studies suggest, instead, that such reactions took place in warm groundwater beneath the Earth’s surface or at hydrothermal vents on the sea ﬂoor. While the nature of proto-life remains a mystery, an image of early life has begun to take shape, based on detailed analysis of the oldest sedimentary rocks. The fossil record deﬁnes the subsequent long-term record of life’s evolution on planet Earth. And, of course, that record is more complete in younger strata. The study of how to identify and name organisms is taxonomy. Taxonomic classiﬁcation of fossils follows the same principles used for the classiﬁcation of living organisms and has a hierarchy of divisions. These principles were ﬁrst proposed in the 18th century by Carolus Linnaeus, a Swedish biologist. What Kinds of Rocks Contain Fossils? Most fossils are found in sediments or sedimentary rocks. Fossils form when organisms die and become buried by sediment, or when organisms travel over or through sediment and leave imprints or debris. The degree of preservation of a fossil reﬂects the context of burial. For example, rocks formed from sediments deposited under anoxic (oxygen-free) conditions in quiet water (such as lake beds or lagoons) can preserve particularly ﬁne specimens. In contrast, rocks made from sediments deposited in high-energy environments where strong currents tumble shells and bones and break them up contain at best only small fragments of fossils mixed with other clastic grains. Fossils sometimes occur in volcaniclastic rocks, but they are not found in intrusive igneous rocks and tend to be destroyed by metamorphism. 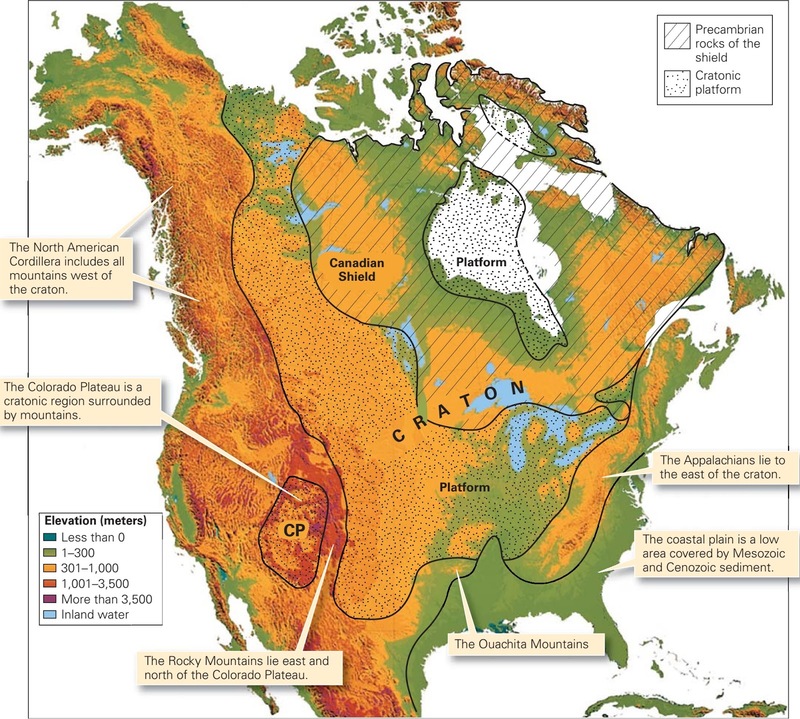 North America’s craton consists of a shield, where Precambrian rock is exposed, and a platform, where Paleozoic sedimentary rock covers the Precambrian. A craton consists of crust that has not been affected by orogeny for at least about the last 1 billion years. As a result, cratons have cooled substantially, and therefore have become relatively strong and stable. Geologists divide cratons into two provinces: shields, in which Precambrian metamorphic and igneous rocks crop out at the ground surface, and cratonic platforms, where a relatively thin layer of Phanerozoic sediment covers the Precambrian rocks (figure above). Leonardo da Vinci, the Renaissance artist and scientist, enjoyed walking in the mountains, sketching ledges and examining the rocks he found there. In the process, he discovered marine shells (fossils) in limestone beds cropping out a kilometre above sea level, and he suggested that the rock containing the fossils had risen from below sea level up to its present elevation. Modern geologists agree with Leonardo, and they now refer to processes causing the surface of the Earth to move vertically from a lower to a higher elevation as uplift. In this section, we look at why uplift occurs, how erosion carves rugged landscapes out of uplifted crust, and why Earth’s mountains can’t get much higher than Mt. Everest. Before plate tectonics theory became established, geologists were just plain confused about how mountains formed. In the context of the new theory, however, the many processes driving mountain building became clear: mountains form primarily in response to convergent-boundary deformation, continental collisions, and rifting. Since collision zones, rifts, and plate boundaries are linear, mountain belts are linear. Below, we look at these different settings and the types of mountains and geologic structures that develop in each one. 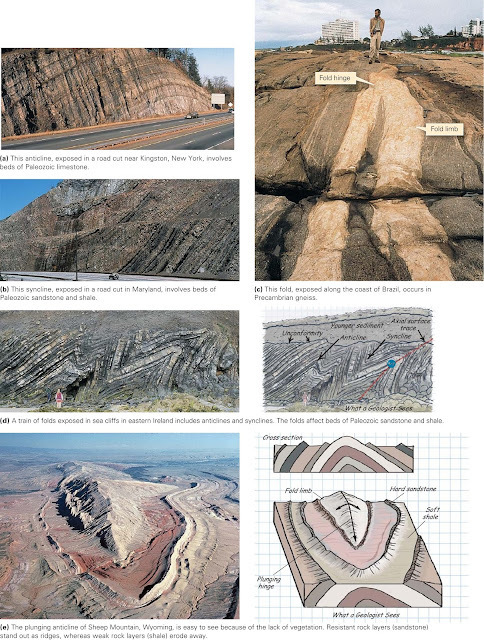 Anticlines, synclines, and monoclines: Folds that have an arch-like shape in which the limbs dip away from the hinge are called anticlines (figure above a), whereas folds with a trough-like shape in which the limbs dip toward the hinge are called synclines (figure above b). A monocline has the shape of a carpet draped over a stair step (figure above c). Non-plunging and plunging folds: If the hinge is horizontal, the fold is called a non-plunging fold, but if the hinge is tilted, the fold is called a plunging fold (figure above d). Domes and basins: A fold with the shape of an overturned bowl is called a dome, whereas a fold shaped like an upright bowl is called a basin (figure above e, f). Domes and basins both display circular outcrop patterns that look like bull’s-eyes the oldest layer occurs in the centre of a dome, whereas the youngest layer is located in the centre of a basin. 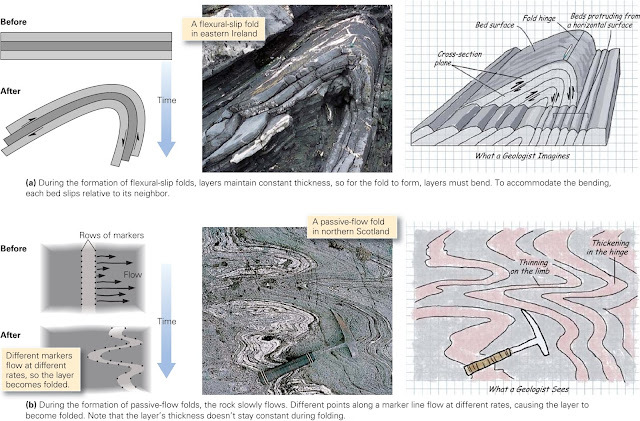 Characteristics of folds on outcrops and in the landscape. Using these terms, now see if you can identify the various folds shown in figure above a–e. Fold development in flexural-slip and passive flow-folding. Folds develop in two principal ways (figure above a, b). During formation of ﬂexural-slip folds, a stack of layers bends, and slip occurs between the layers. The same phenomenon happens when you bend a deck of cards to accommodate the change in shape, the cards slide with respect to each other. Passive-ﬂow folds form when the rock, overall, is so soft that it behaves like weak plastic and slowly ﬂows; these folds develop simply because different parts of the rock body ﬂow at different rates. Folding is caused by several different processes, as illustrated by the following cross sections. Why do folds form? Some layers wrinkle up, or buckle, in response to end-on compression (figure above a–d). Others form where shear stress gradually shifts one part of a layer up and over another part. Still others develop where rock layers move up and over step-like bends in a fault and must curve to conform with the fault’s shape. Finally, some folds form when new slip on a fault causes a block of basement to move up so that the overlying sedimentary layers must warp. In an undeformed sandstone, the grains of quartz are roughly spherical, and in an undeformed shale, clay ﬂakes press together into the plane of bedding so that shales tend to split parallel to the bedding. During ductile deformation, however, internal changes take place in a rock that gradually modify the original shape and arrangement of grains. For example, quartz grains may transform into cigar shapes, elongate ribbons, or tiny pancakes, and clay ﬂakes may recrystallize or reorient so that they lie at an angle to the bedding. Overall, deformation can produce inequant grains and can cause them to align parallel to each other. We refer to layering developed by the alignment of grains in response to deformation as tectonic foliation. 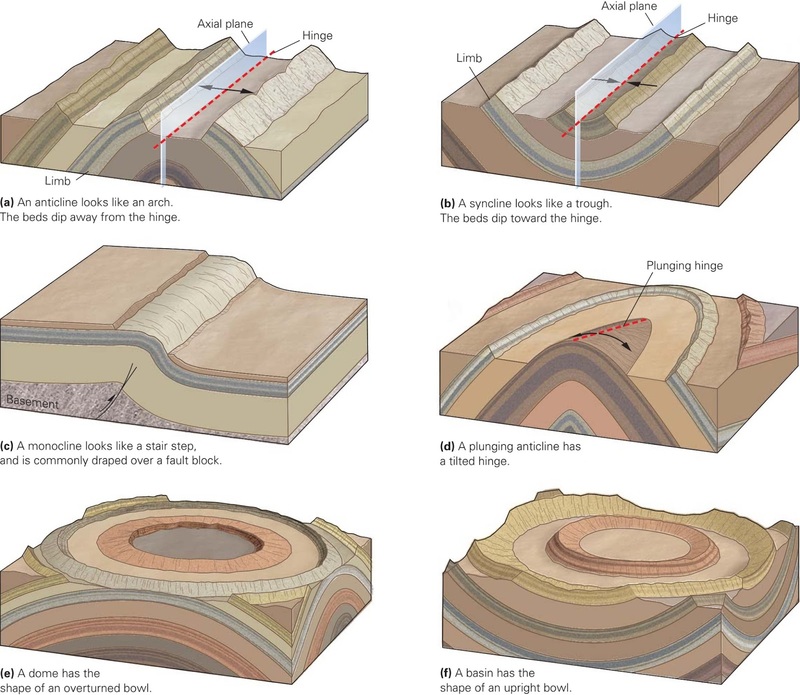 The development of tectonic foliation in rock. 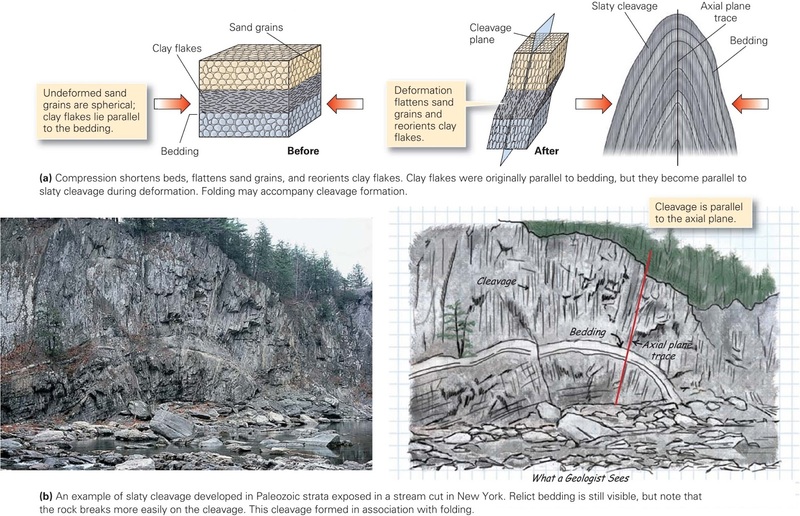 We introduced foliation, such as slaty cleavage, schistosity, and gneissic layering, while discussing the effects of metamorphism. Here we add to the story by noting that such foliation forms in response to ﬂattening and shearing in ductilely deforming rocks in other words, foliation indicates that the rock has developed a strain under metamorphic conditions (figure above a, b). Examples of joints and veins. If you look at the photographs of rock outcrops, you’ll notice thin dark lines that cross the rock faces. These lines represent traces of natural cracks along which the rock broke and separated into two pieces during brittle deformation. Geologists refer to such natural cracks as joints (figure above a, b). Rock bodies do not slide past each other on joints. Since joints are roughly planar structures, we deﬁne their orientation by their strike and dip, as described in (Describing the Orientation of Geologic Structures). What Are Deformation and Strain? 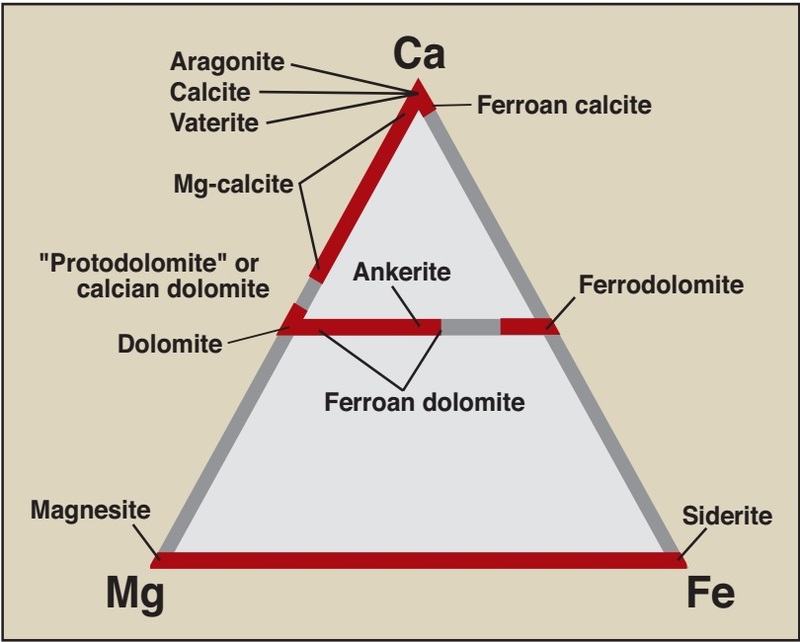 Deformation changes the character and conﬁguration of rocks. To get a visual sense of what geologists mean by the term deformation, let’s contrast rock that has not been affected by an orogeny with rock that has been affected. Our “undeformed” example comes from a road cut in the Great Plains of North America, and our “deformed” example comes from a cliff in the Alps of Europe (figure above a, b). Let’s now utilize your knowledge of seismic velocity, refraction, and reﬂection to see how each of the major layer boundaries inside the Earth was discovered. The concept that seismic waves refract at boundaries between different layers led to the ﬁrst documentation of the core-mantle boundary. In 1909, Andrija Mohorovicic, a Croatian seismologist, noted that P-waves arriving at seismometer stations less than 200 km from the epicentre travelled at an average speed of 6 km per second, whereas P-waves arriving at seismometers more than 200 km from the epicentre travelled at an average speed of 8 km per second. To explain this observation, he suggested that P-waves reaching nearby seismometers followed a shallow path through the crust, in which they travelled relatively slowly, whereas P-waves reaching distant seismometers followed a deeper path through the mantle, in which they travelled relatively rapidly (figure above a, b). The propagation of earthquake waves. 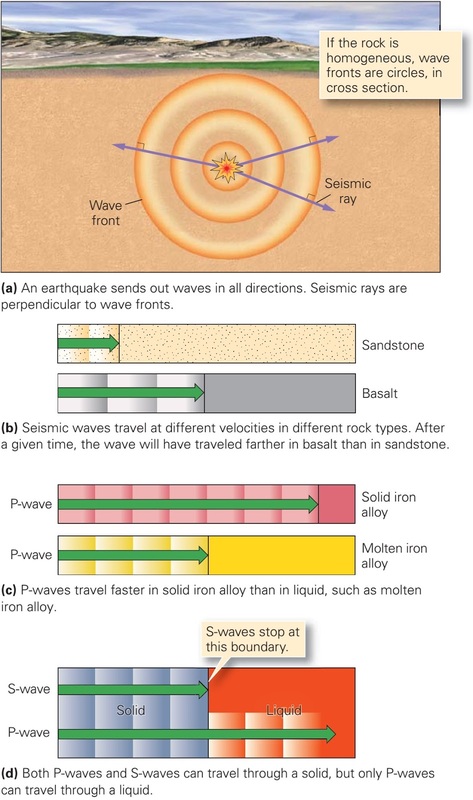 The energy released by an earthquake moves through rock in the form of waves, just as waves propagate outward from the impact point of a pebble on the surface of a pond. The boundary between the rock through which a wave has passed and the rock through which it has not yet passed is called a wave front. In 3-D, a wave front expands outward from the earthquake focus like a growing bubble. We can represent a succession of waves in a drawing by a series of concentric wave fronts. The changing position of an imaginary point on a wave front as the front moves through rock is called a seismic ray. You can picture a seismic ray as a line drawn perpendicular to a wave front; each point on a curving wave front follows a slightly different ray (figure above a). The time it takes for a wave to travel from the focus to a seismometer along a given ray is the travel time along that ray. Some earthquakes shake the ground violently, whereas others can barely be felt. Seismologists have developed two scales to deﬁne size in a uniform way, so that they can systematically describe and compare earthquakes. The ﬁrst scale focuses on the severity of damage at a locality and is called the Mercalli Intensity scale. The second focuses on the amount of ground motion at a speciﬁc distance from the epicentre, as measured by a seismometer, and is called the magnitude scale. Most news reports about earthquakes provide information on the size and location of an earthquake. What does this information mean, and how do we obtain it? What’s the difference between a large earthquake and a minor one? How do seismologists locate an epicentre? To answer these questions we must ﬁrst understand how a seismometer works and how to read the information it provides. Of these various reasons, faulting related to plate movements is by far the most signiﬁcant. 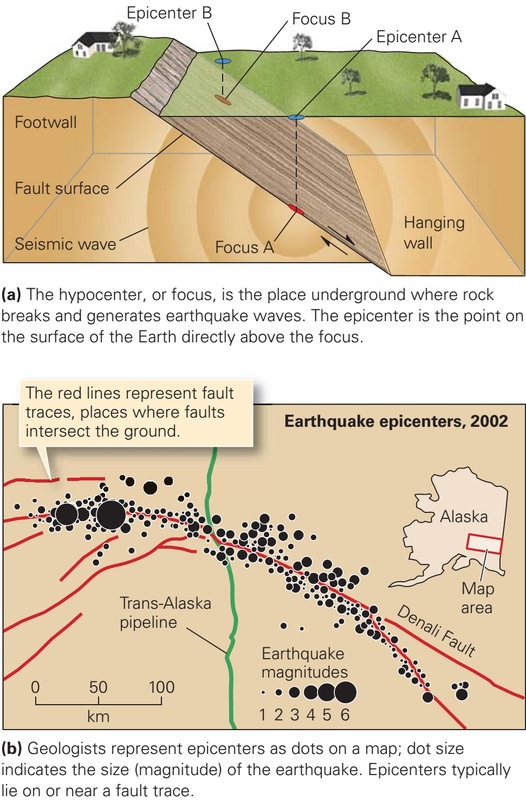 In other words, where do most earthquakes occur are along faults slip. The place within the Earth where rock ruptures and slips, or the place where an explosion occurs, is the hypocenter or focus of the earthquake. Energy radiates from the focus. The point on the surface of the Earth that lies directly above the focus is the epicentre, so maps can portray the position of epicentres (figure above a, b). Since slip on faults causes most earthquakes, we focus our discussion on faults. How earthquakes happen? Where do most earthquakes occur? Why do earthquakes happen? How do earthquakes happen? Where are earthquakes most likely to occur? Why do earthquakes happen? Examples of fault displacement on the San Andreas fault in California. At ﬁrst glance, a fault may look simply like a fracture or break that cuts across rock or sediment. But on closer examination, you may be able to see evidence of sliding that occurred on a fault. For example, the rock adjacent to the fault may be broken up into angular fragments or may be pulverized into tiny grains, due to the crushing and grinding that can accompany slip, and the surface of a fault may be polished and grooved as if scratched by a rasp. In some localities, a fault cuts through a distinct marker (a sedimentary bed, an igneous dike, or a fence); where this happens, the end of the marker on one side of the fault is offset relative to the end on the other side. The distance between two ends of the marker, as measured along the fault surface in the direction of slip, is the fault’s displacement (figure above a, b). Many faults are completely underground, and will be visible only if exposed by erosion of overlying rock. But some faults intersect and offset the ground surface, producing a step called a fault scarp (figure below a). The ground surface exposure of a fault is called the fault line or fault trace. The basic types of fault. Fault types are distinguished from one another by the direction of slip relative to the fault surface. 19th-century miners who encountered faults in mine tunnels referred to the rock mass above a sloping fault plane as the hanging wall, because it hung over their heads, and the rock mass below the fault plane as the footwall, because it lay beneath their feet. The miners described the direction in which rock masses slipped on a sloping fault by specifying the direction that the hanging wall moved in relation to the footwall, and we still use these terms today. When the hanging wall slips down the slope of the fault, it’s a normal fault. When the hanging wall slips up the slope, it’s a reverse fault if steep, and a thrust fault if shallowly sloping (figure above a–c). Strike-slip faults are near-vertical planes on which slip occurs parallel to an imaginary horizontal line, called a strike line, on the fault plane no up or down motion takes place on such faults (figure above d). Faults are found in many locations but don’t panic! Not all of them are likely to be the source of earthquakes. Faults that have moved recently or are likely to move in the near future are called active faults (and if they generate earthquakes, news media sometimes refer to them as “earthquake faults”). Faults that last moved in the distant past and probably won’t move again in the near future are called inactive faults. 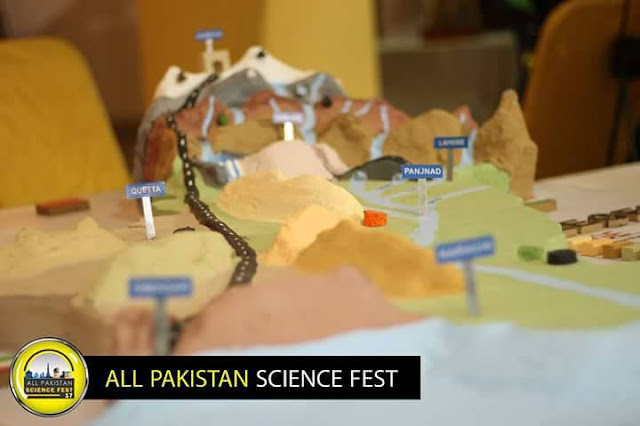 What is the relationship between faulting and earthquakes? Earthquakes can happen either when rock breaks and a new fault forms, or when a pre-existing fault suddenly slips again. Let’s look more closely at these two causes. A model representing the development of a new fault. Rupturing can generate earthquake-like vibrations. Earthquakes due to fault formation: Imagine that you grip each side of a brick-shaped block of rock with a clamp. Apply an upward push on one of the clamps and a downward push on the other. By doing so, you have applied a “stress” to the rock. (Stress refers to a push, pull, or shear.) At first, the rock bends slightly but doesn't break (figure above a). In fact, if you were to stop applying stress at this stage, the rock would return to its original shape. Geologists refer to such a phenomenon as elastic behaviour the same phenomenon happens when a rubber band returns to its original shape or a bent stick straightens out after you let go. Now repeat the experiment, but bend the rock even more. If you bend the rock far enough, a number of small cracks or breaks start to form. Eventually the cracks connect to one another to form a fracture that cuts across the entire block of rock (figure above b). The instant that this fracture forms, the block breaks in two and the rock on one side suddenly slides past the rock on the other side, and any elastic bending that had built up is released so the rock straightens out or rebounds (figure above c). Because sliding occurs, the fracture has become a fault. A fault can’t slip forever, for friction eventually slows and stops the movement. Friction, defined as the force that resists sliding on a surface, is caused by the existence of bumps on surfaces these bumps act like tiny anchors and snag on the opposing surface. Earthquakes due to slip on a pre-existing fault: Once a fault comes into being, it is a scar in the Earth’s crust that can remain weaker than surrounding, intact crust. When stress builds sufficiently, it overcomes friction and the pre-existing fault slips again. This movement takes place before stress becomes great enough to cause new fracturing of surrounding intact rock. Note that after each slip event, friction prevents the fault from slipping again until stress builds again. 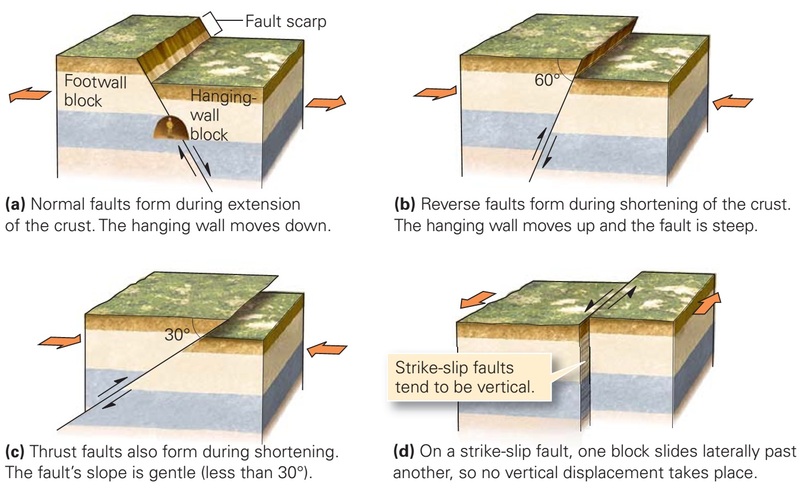 Geologists refer to such alternation between stress buildup and slip events (earthquakes) as stick-slip behaviour. The breaking of rock that occurs when a fault slips, like the snap of a stick, generates earthquake energy. The concept that earthquakes happen because stresses build up, causing rock adjacent to the fault to bend elastically until slip on the fault occurs is called the elastic-rebound theory. 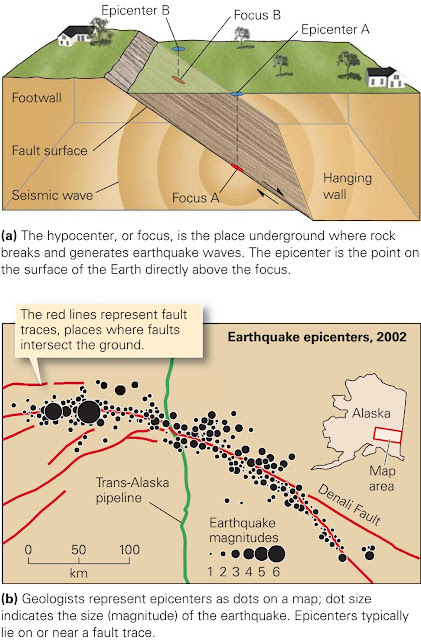 Of note, the major earthquake (or “mainshock”) along a fault may be preceded by smaller ones, called foreshocks, which possibly result from the development of the smaller cracks in the vicinity of what will be the major rupture. Smaller earthquakes, called aftershocks, occur in the days to months following a large earthquake. The largest aftershock tends to be ten times smaller than the mainshock, and most are even smaller. Aftershocks happen because slip during the mainshock does not leave the fault in a perfectly stable conﬁguration. For example, after the mainshock, irregularities on one side of the fault surface, in their new position, may push into the opposing side and generate new stresses. Such stresses may become large enough to cause a small portion of the fault around the irregularity to slip again, or may trigger slip in a nearby fault. How much of a fault surface slips during an earthquake? The answer depends on the size of the earthquake: the larger the earthquake, the larger the slipped area and the greater the displacement. For example, the major earthquake that hit San Francisco, California, in 1906 ruptured a 430-km-long (measured parallel to the Earth’s surface) by 15-km-deep (measured perpendicular to the Earth’s surface) segment of the San Andreas fault. Thus, the area that slipped was almost 6500 km2. During the 2011 Tohoku earthquake an area 300 km long by 100 km wide (30,000 km2) slipped. The amount of slip varies along the length of a fault the maximum observed displacement during the 1906 earthquake was 7 m, in a strike-slip sense. Slip on a thrust fault that caused the 1964 Good Friday earthquake in southern Alaska reached a maximum of 12 m, and the maximum slip during the Tohoku earthquake was over 20 m. Smaller earthquakes, such as the one that hit Northridge, California, in 1994, resulted in only about 0.5-m slip even so, this earthquake toppled homes, ruptured pipelines, and killed 51 people. The smallest-felt earthquakes result from displacements measured in millimetres to centimetres. Although the cumulative movement on a fault during a human life span may not amount to much, over geologic time the cumulative movement becomes signiﬁcant. For example, if earthquakes occurring on a strike-slip fault cause 1 cm of displacement per year, on average, the fault’s movement will yield 10 km of displacement after 1 million years.